Valentine’s, or Galentine’s, Day, however you choose to celebrate, is just around the corner. Who doesn’t like trading in their winter sweats for a pop of red to exchange love notes, all while eating lots of chocolate with the ones you care about most! Getting dolled up is fun, but investing the time to put a look together can be tedious. 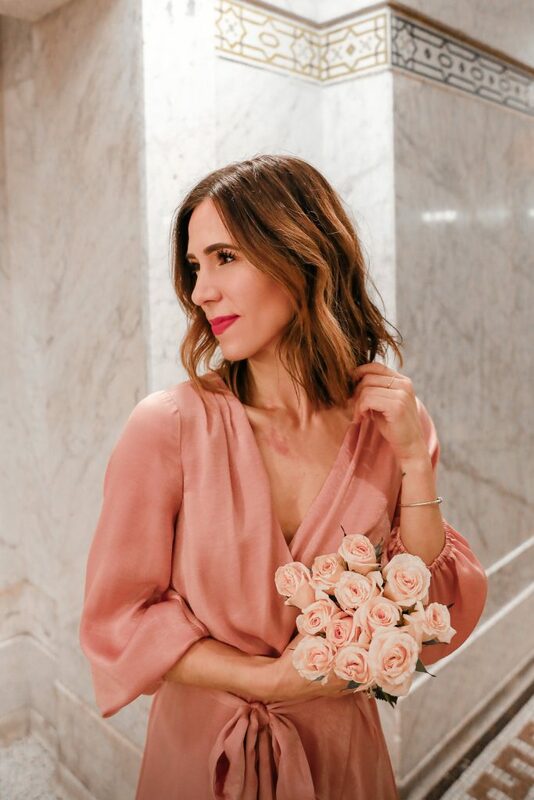 With the help of JOAH Beauty, I’ve put together two Valentine’s Day Inspired Make-Up looks – a gilded eye look for the uber feminine and a bold lip look for the classic Hollywood glam. JOAH Beauty is a Korean Beauty brand that strives to bring K Beauty to the cosmetic world – they have amazing products that will leave your skin flawless! See the full article on The Inspired Home HERE. JOAH Beauty was also kind enough to gift me enough product to share with my readers – head to my Instagram HERE to enter my Valentine’s Day beauty giveaway! Straight off the New York Fashion Week runway, the gilded eye look is a celebrity favorite. Gold is an extremely versatile hue that flatters everyone! There is something so feminine and powerful about a gold eye lid! The “Birthday Suit’ eyeshadow palette from JOAH Beauty made all my gilded eye dreams come true! This versatile palette has three gorgeous gold hues that you can blend to create the perfect gilded eye! Since I’m styling this look with a neutral lip, I have room to play with darker colors for my eyes! By blending ‘Upbeat’ and ‘Good Vibes’ I was able to achieve the perfect bronze-y eye for a night out! To make your eyes really pop, dab a little bit of ‘Whip Cream’, from the shadow palette, in the corner of your eyes! I finished my eyes with the JOAH Beauty ‘Eye Scream’ Volume and Define Mascara to give my lashes a bold and full look. Next I start by prepping my skin with the JOAH Beauty ‘Glow Activator’ Radiance Primer. Infused with gold flakes, this all-purpose primer helps create the perfect canvas for your make-up application. The “Radiant Beauty Balm’ helps to even out my skin-tone giving it that sheer glow to pair with my gilded eye. 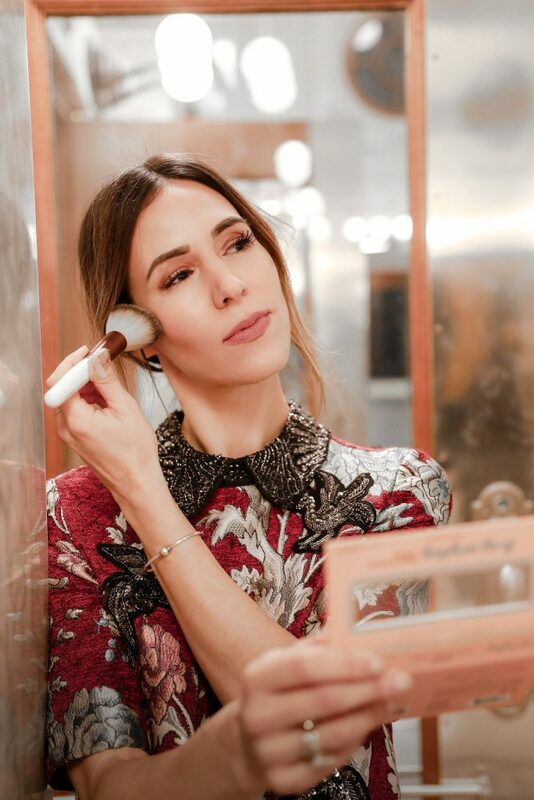 To help define my cheekbones, I used the ‘Be my Everything’ Bronze Palette – a little contouring never hurt anyone. To make the look last through the night, I sprayed their ‘Selfie Ready’ Setting Spray – it keeps your make-up looking fresh and matte all night! You can never go wrong with that classic Hollywood red-carpet lip for a Valentine’s Day look! It’s easy to create and styles well with anything – not to mention it took all of 20 minutes to put together, lashes and all. Similar to the gilded eye look, I prepped by skin with the JOAH Beauty ‘Glow Activator’ Radiance Primer, followed by the “Radiant Beauty Balm’ in light / medium. When you are creating a look with a bold lip, you really want to ensure that it’s the focal point of your entire look. To add some color to my cheeks, I used the ‘Be my Everything’ Bronze Palette again – the palette has a spectrum from light to dark so I dabbed by brush on the light end for a slightly tinted cheek. For my eyes, I dabbed ‘Whipped Cream’ from the ‘Birthday Suit” Eyeshadow Palette to help brighten and neutralize my eye, followed by their amazing mascara from the first look. Now for the hero of the look, this matte velvet lipstick from JOAH Beauty in ‘Cherry Cheesecake’ – it’s the perfect vivid red! To set the look, I used the Selfie Ready’ Setting Spray to keep my skin fresh for the night! This post is sponsored by The Inspired Home – all thoughts are my own. Thank you The Inspired Home for their continued partnership with Sportsanista. Thanks Kelsey!! That means a lot!